I am stoked today. 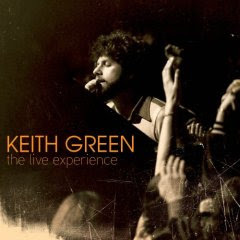 A friend sent me the "new" Keith Green album with CD and DVD - Live Experience. A collection of live version of his songs on CD and some video. Some of which have not been seen or heard before. Keith was a massive influence in my life when I first heard his music in the early 80's just after his untimely death. Listening to some of the songs again today, he hay have not been the best singer and his style of music not vogue today but his prophetic words still cut to heart. My iPod will be on repeat for a couple of days.